Prepare pasta according to package instructions, or fill a large saucepan about half full of water and add salt. Cover and bring to a boil over high heat. Add pasta and cook until al dente, about 7 to 9 minutes. Remove 1/4 cup cooking liquids and set aside for later. Drain pasta then return to saucepan and cover to keep warm. While preparing pasta, heat a large skillet over medium heat. Add pine nuts and stir continually until fragrant and just turning golden. Transfer to a small plate or bowl to cool. Grate, shred, or shave fresh Parmesan cheese and set aside. Mince garlic. Heat oil in large skillet over medium-low heat. Add garlic and cook, stirring frequently 1 to 2 minutes. Remove from heat and let stand while you continue. Trim asparagus spears by cutting off and discarding the bottom one-third or one-half, leaving the top 6 to 8 inches. Slice across asparagus spears on the diagonal into 1- to 2-inch pieces. Add asparagus and water to skillet and return to medium-low heat. Stir, then cover and steam, 2 to 3 minutes, or until crisp-tender. 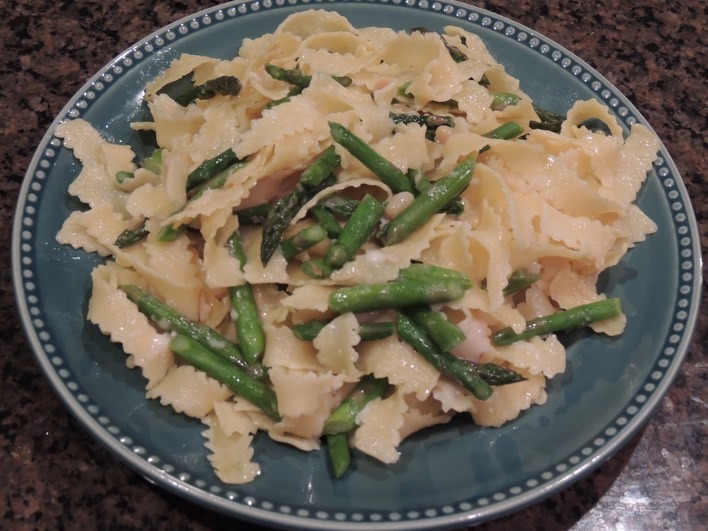 Add asparagus mixture to pasta in the saucepan, along with reserved pasta liquids. Toss to combine. Heat over low until water has been absorbed. Add olive oil, salt, and pepper, and toss again. Garish with Parmesan and pine nuts.